Greek-style fish taverna in Fells Point. 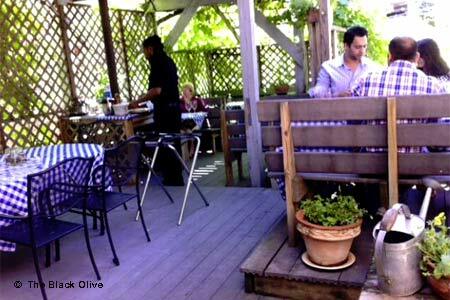 : The Black Olive offers authentic organic Greek cuisine. Take your waiter up on his invitation to join him in the kitchen for a view of the day's catch. Will it be the rockfish for you this evening? Or the dorade royale, or perhaps the barbouni, the only fish the ancients deemed acceptable as a sacrifice to the gods? Whatever your pleasure, it will soon arrive, burnished by the grill and garnished with little more than a hint of olive oil, a squeeze of lemon and a couple of capers, and it will be filleted at tableside. Sides are simple --- an orzo salad, studded with sun-dried tomatoes and olives, along with some lightly sautéed squash. The Spiliadis family, owners of this expanded Fells Point taverna, knows the secret: fish this fresh needs nothing more to show off its inner beauty. Start with the melitzanasalata, just eggplant, lemon and garlic with a big basket of house-made bread for scooping it up. Add an intriguing bottle of Greek wine from the carefully compiled list. Then finish with baklava and the fresh fruit plate. Admittedly, an à la carte feast here is a pricey proposition, but there’s always the option of ordering several small plates to share with friends.